While on vacation last week, hanging out near the ice cream freezer as my son bought my three granddaughters frozen treats at a little grocery store/restaurant/bait shop in the Eastern Sierra, I got a grumpy look and comment from the cashier about my apparently wretched state of barefooted-ness, which I took as an invitation to mosey on out the door. Was I upset at being humiliated in front of my three innocent grandkids? 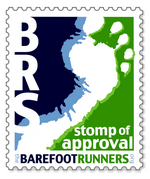 Happy BAREFOOT Summer Trails, y’all! I really liked Jessi’s approach to “Sole-less Footwear Solutions” and her examples of how to use cord/lacing/twine to look like sandal straps–for so many of the reasons she listed: Individuality, Travel, Frugality, Access, Social Interaction, Earth-Friendly. Happy Trails! As a fellow barefooter, living in SoCal, I’m sorry that the vibe you got implied you “had to leave.” I hope you don’t get that vibe again. Understood, Ma’am. I love being outdoors, but your point is taken! My bare feet can handle the heat, but my body is different. I need to get accustomed to the SoCal heat. I got no issues with nekkid feet. Store owners have to be careful of liability if you were to damage your tootsies. Still, I gotta say that it’s hard to understand why a grocery store/bait shop would be fussy about bare feet, clean or dirty.